Unpaid interns are getting a raw deal. On top of working for no pay, they're far less likely than paid interns to get a full-time job offer after the internship ends, according to a survey by the National Association of Colleges and Employers. Unpaid interns received full-time job offers about 44% of the time. Paid interns were offered jobs 72% of the time, the survey found. "Employers rightly look at a paid internship as more of a real job," says Ross Eisenbrey, vice president at the Economic Policy Institute, a Washington research group. "If you were paid for something, there was probably more valuable work done." 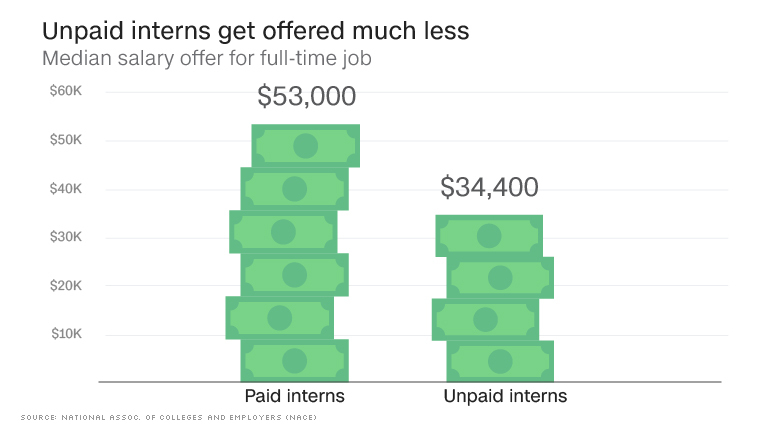 Even the unpaid interns who received full-time job offers were paid less out of the gate. At private companies, unpaid interns received a median job offer of about $34,400. Paid interns at private firms were offered jobs with a median salary of $53,521, NACE found. "An unpaid internship signals that you have been willing to work for nothing, therefore you might be willing to accept a lower job offer than a paid intern would," says Eisenbrey. (Interns at EPI are paid, he says). There's been a lot of criticism about unpaid internships, including whether they violate labor laws. And some experts argue that only well-off students can afford to take advantage of unpaid internships, while lower income students must take summer jobs to earn money. The White House, for example, has been criticized for not paying its interns. No official stats track the number of unpaid interns every year, but estimates vary from 500,000 to 1 million. The survey's findings are worrisome considering that there has been an overall hiring slowdown over the past several months. Fewer employers are also sending recruiters to college campuses and some, such as Goldman Sachs (GS), are beginning to conduct automated interviews. Employers say these interviews remove biases, such as mutual friends, and allow them to hear from a more diverse mix of candidates. Yet graduates argue that automation doesn't allow them to better understand the employer or display their people skills. The job market for college graduates has improved since the Great Recession. The unemployment rate for young college graduates ages 21 to 24 peaked at 9.9% in 2011. Today, it's about 5.6%, according to EPI. The national unemployment rate is 4.7%. 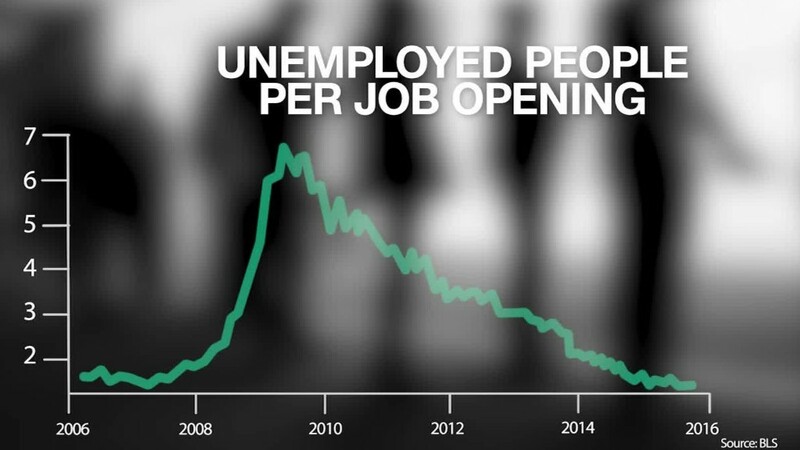 Despite better job prospects overall, college grads are still saddled with high underemployment -- working a part-time job or a job that doesn't provide enough hours. Before the recession, the underemployment rate for young college grads hovered around 9% in 2007. Today, it's about 12.6%, EPI reports. "The college job market has improved considerably since...the peak of the recession," says Ed Koc, head of research at NACE, the surveyor. "The problem is that there are indications that the economy is slowing and any kind of slowing is going to impact the college job market."